The new James Bond film is a sharp, thrilling, classy, and rich-looking installment announcing a confident trajectory for the Daniel Craig iteration of James Bond. The James Bond film series has experienced growing pains during its five decades: the awkward political correctness in the Pierce Brosnan era (Tomorrow Never Dies‘s “Filthy habit!”), Sean Connery’s dubious high-priced return to Diamonds Are Forever for a very silly moon buggy chase scene, the preposterous gadgets in Die Another Day, and the failure to figure out what to do with Timothy Dalton. Quantum of Solace, with its return to convention and its ridiculous title, threatened to attenuate the good will established by the series reboot, Casino Royale. But I’m pleased to report that Skyfall is a sharp, thrilling, classy, and rich-looking installment announcing a confident trajectory for the Daniel Craig iteration of James Bond. While it’s somewhat alarming to see Craig transform from the new double circle on the block to aging agent in six mere years, he remains an enjoyably chilly and crisp Bond, preferring to unleash his quiet fury when his car is destroyed rather than when the people around him die. He’s good enough to ask about agents who have been killed, but this is more of a functional than a empathic query. He’s willing to rip shards of depleted uranium from his chest to ID a sniper. When given little more than a radio transmitter and a pistol responding to his thumbprint from Q or the family hunting rifle for a final showdown, he’ll make do with the Spartan setup. He’s the James Bond for the “too big to fail” age. If he wasn’t busy strangling henchmen with his legs in icy water, he’d have a bustling career as a corporate efficiency expert. We’re informed early on that not everybody can make it out in the field. But while a lesser action film would drop this idea after the handsome actors deliver the details to advance the story, Skyfall actually follows up on this idea throughout its fast-moving two and a half hours. 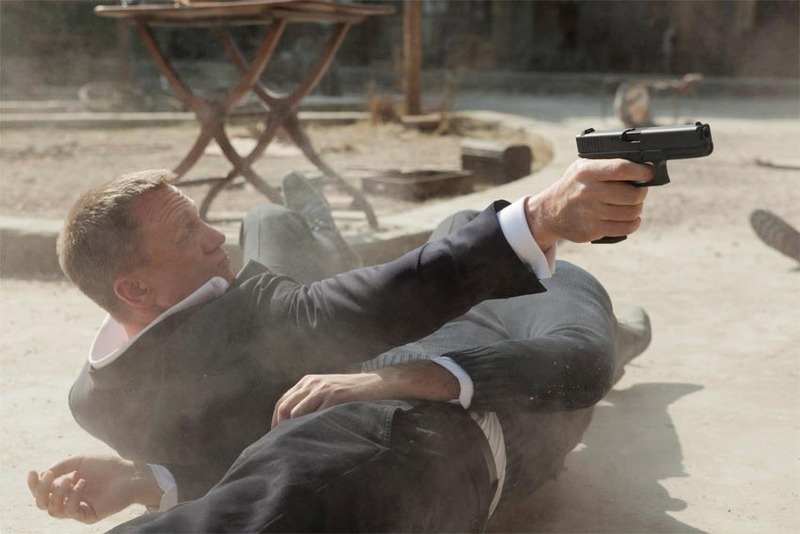 Aside from the many literal missed shots informing the narrative, Skyfall is smart enough to show us M’s poor pistol marksmanship when away from the office. We also see an injured Bond lose his aim after a serious injury (with Silva taking advantage of this later on an island in a very gripping William Tell moment). We even get to see M reciting Tennyson’s “Ulysses” during a public inquiry. Beyond this unexpected literary reading (not without precedent, given Simon Raven’s contributions to On Her Majesty’s Secret Service), there’s also an unexpected cameo from an obnoxious CNN anchor. The priapic qualities of the old world may gave us James Bond, but it also saddles us with Wolf Blitzer. I suspect these sly nuances — which have much to do with John Logan working with the established Neal Purvis and Robert Wade screenwriting team this time around — may cause Skyfall to hold up slightly better than Casino Royale‘s darker edge and Guantanamo Bay-inspired torture scene. While it’s tempting to compare the three Daniel Craig films with Christopher Nolan’s Dark Knight trilogy, Skyfall allows us more room to settle in. It’s possible that the delay in production caused Skyfall‘s creative team to tighten what they had. Because the exciting opening train chase, Silva’s indelible parable of the two rats, and the new Q trying to hide his sneaky work from Gareth Mallory are the types of moments that emerge from artful and well-considered entertainment. It was also a brilliant move to get Roger Deakins on board as cinematographer. His ambers and umbers give this film the glow of fifty year scotch. There’s one especially coruscating scene in a Shanghai high rise, where Bond dukes it out with a sniper against the dazzling backdrop of endless glass and projected lights from the outside rolling slowly into the dark. While Adele’s theme song is marvelous, Thomas Newman’s pulsating score is a major disappointment. Newman’s music here seems more at home in a forgettable action movie playing on HBO at three in the morning. I don’t know if John Barry can ever be replaced, but if the Bond films are going to step it up with installments like Casino Royale and Skyfall, then the Broccoli-Wilson team needs a composer to match. At times, Skyfall is a little too reliant upon Silva’s theatrics, which threaten to overshadow the film’s mild efforts to deepen the relationship between Bond and M. This may be because Silva is one of the best Bond villains in years. When Silva tells Bond about what he did to get where he is today (with director Sam Mendes wise enough to hold this performance in a long take), Bardem instantly commands your attention. But the film flags a bit just before his first appearance, even after it has gone to the trouble to destroy a pivotal base in a gas explosion. We all know that the James Bond films tend to require the bad guys to inform us of their vile plans in person. But these are pedantic beefs. I enjoyed Skyfall a great deal. I even found myself blurting out “Awesome!” during a particularly sinister exchange between Bond and Silva. And if that is the measure of whether you should see this movie, Skyfall more than lives up. © 2012, Edward Champion. All rights reserved. Wow! This was a great review, and made me even more excited for this movie to premiere! I agree that Daniel Craig’s Bond films have really explored the darker side of him and done a great deal to show his mortality. I like that they are challenging the ways of the past in this film, showing that technology could be Bond’s downfall. I have been counting down the days to this premiere with a coworker at DISH. We have been preparing for it by re-watching the previous 007 movies with Blockbuster @Home from DISH. It helps that it’s so easy to get them delivered in the mail, exchanging them in the store if we can’t wait. It is interesting to watch the way that James Bond has evolved throughout the years. This movie sounds so different from the previous ones, everything from an aging agent, to the incredible Javier Bardem could make this the greatest Bond film to date.